Early-onset acne is reaching younger generations more quickly than before, with approximately 20% of the young population (13-years-old and younger) affected by moderate-to-severe acne, according to Persistence Market Research. 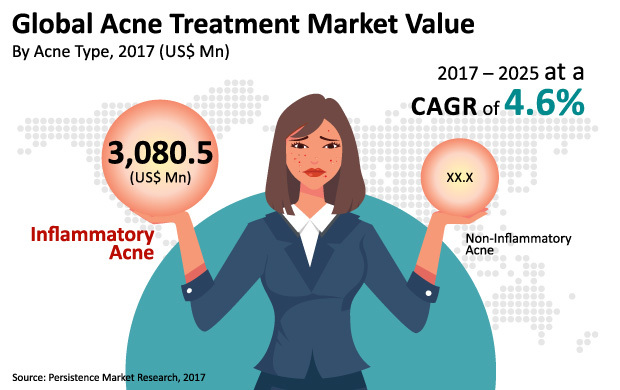 These changing consumer demographics, along with heightened demand for acne treatment, will help the global acne market reach $7,348 million by 2025, with a CAGR of 4.6% (from 2017–2025). Non-invasive treatments, a growing trend in esthetics, and topical applications are preferred by dermatologists and allow easier patient adaptability. The report found that a number of top medical companies in the acne treatment sphere are increasing distribution in emerging countries to improve market presence—and to open the door for medical tourism opportunities. The Asia-Pacific (APAC) market is close behind with an expected $1,718 million revenue and 4.8% CAGR.